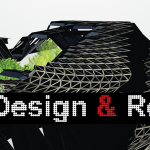 The Digital Design & Research – workshop12 focuses on the new possibilities that algorithmic design methods and parametric modeling offer for architectural design. This year the workshop is attended by architecture, mathematic and structural engineering students. The collaboration between these different fields aims for the greater understanding of the possibilities of computational design. We will explore and test out new possibilities that these new digital design tools offer, such as simulation and optimization, mass customization and variation. 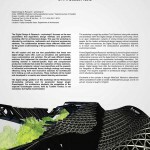 We will seek different design solutions that implement the structural properties of a selected building material in material-specific ways and computerized production methods that enable the realization of these solutions. 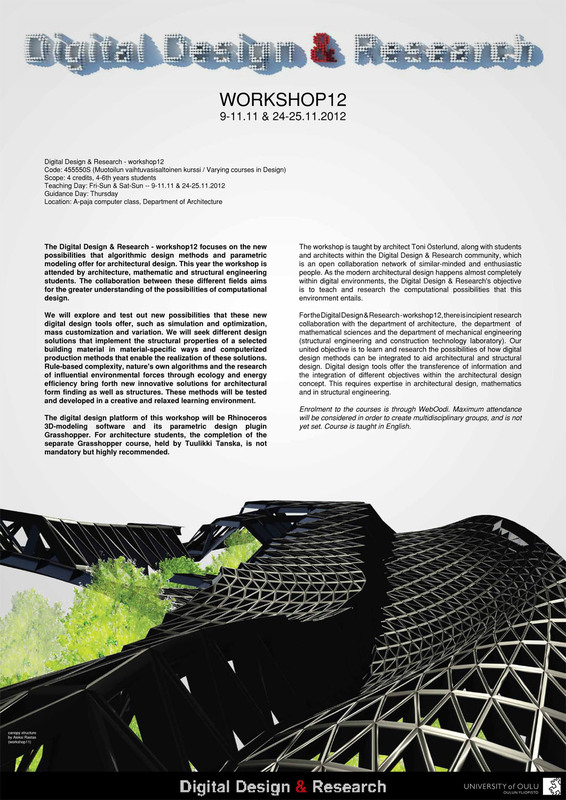 Rule-based complexity, nature’s own algorithms and the research of influential environmental forces through ecology and energy efficiency bring forth new innovative solutions for architectural form finding as well as structures. These methods will be tested and developed in a creative and relaxed learning environment. The workshop is taught by architect Toni Österlund, along with students and architects within the Digital Design & Research community, which is an open collaboration network of similar-minded and enthusiastic people. As the modern architectural design happens almost completely within digital environments, the Digital Design & Research’s objective is to teach and research the computational possibilities that this environment entails. For the Digital Design & Research – workshop12, there is incipient research collaboration with the department of architecture, the department of mathematical sciences and the department of mechanical engineering (structural engineering and construction technology laboratory). Our united objective is to learn and research the possibilities of how digital design methods can be integrated to aid architectural and structural design. Digital design tools offer the transference of information and the integration of different objectives within the architectural design concept. This requires expertise in architectural design, mathematics and in structural engineering.